Sensors Unlimited, Inc.’s 640HS-1.7RT and SU640HS-Vis-1.7RT SWIR video cameras bring InGaAs imaging advantages to inspection, sorting, microscopy, laser beam profile/alignment, machine vision and other non-military applications. Sensors Unlimited, Inc.’s 640HS-1.7RT and 640HS-Vis-1.7RT SWIR video cameras bring InGaAs imaging advantages to inspection, sorting, microscopy, laser beam profile/alignment, machine vision and other non-military applications. 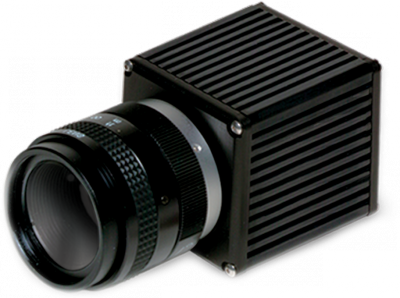 The 640 x 512 pixel snapshot detector features high QE from 0.9 to 1.7 µm (VIS option: 0.5 to 1.7) without moving parts - no fans or shutters required. Preconfigured with user selectable modes, it operates at 30 frames per second full-frame full-motion video, or 7 fps for weaker signals, and offers windowing for higher frame rates. The camera is easy to use, with built-in non-uniformity corrections (NUCs), Automatic Gain Control (AGC), and image enhancement. Simultaneous output via EIA170 analog video and Camera Link® 12-bit digital video in either enclosed or OEM versions provide user flexibility. The camera includes a 25 mm f/1.4 lens and C-mount adapter, while the user has the flexibility to use the SUI SWIR optimized SOLO lenses with the integral M42 mount, or purchase an adjustable F-mount adapter for photographic lenses. * λ = 1.55 µm, exposure time = 33 ms, case temperature = 20°C, highest sensitivity gain setting, no lens, x1 digital gain with enhancement, AGC, and correction off. **The pre-configured exposure times include factory stored non-uniformity corrections. Additional exposure times are programmable via RS-232 commands.